The club officially commenced in July 1964, although there is evidence that some form of rescue service has operated from the same approximate area since the early 1900s. The original clubhouse was an old timber cottage, however due to substantial alterations, renovations & extensions, Narrabeen Beach now boasts one of the most magnificent & modern facilities on Sydney's northern beaches. 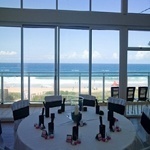 The Narrabeach Function Room is the perfect venue for weddings, engagements & other celebrations. It has a polished timber floor & floor-to-ceiling glass windows overlooking lush green lawns which lead down to the ocean. The room is 20m x 10m & can cater for 120 people formally seated or up to 200 people in a more casual setting. Hirers of the Narrabeach Room have exclusive use of the commercial kitchen. The venue is licensed and has bar facilities. Our room rates include the hire of the room, tables & chairs (if required) & post event cleaning, which provides the opportunity to host an event in a magnificent setting at a very reasonable cost.